This post has been updated, you will find the original posting at the bottom of this article. 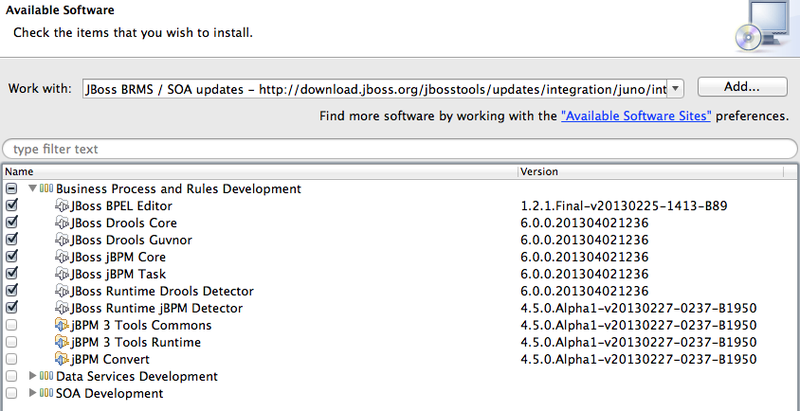 The final release of the Integration & BPM tooling for JBoss Developer Studio (JBDS) has gone public. This is now arranged centrally, funny enough, in the JBoss Central tab of your JBDS 7.1. Illustration 1 shows that if you access the Software/Update tab at the bottom of JBoss Central, you will find the product tooling available to you. Just select the checkbox that applies to you. The original post below still applies, but requires more work by hand on your part, so I suggest you take the approach outlined above. Continuing on the series of how to install and configure your latest JBoss Dev Studio (JBDS) for JBoss BRMS / SOA products, here we provide the latest early release of JBDS version 7. The plugin update site for the BRMS and SOA tooling is providing developing components so be aware of that. Get the latest JBDS 7 from your local Customer Support Portal (CSP) or get your evaluation copy.